On May 22, 2012, the CCMR held its annual symposium. The program is a networking and learning opportunity for scientists in industry and at Cornell to develop collaborative work. The symposium gathered 166 off-campus guests and Cornell faculty and students; 17 companies were represented. Professors Sol Gruner, Physics; David Muller, Applied and Engineering Physics and Jiwoong Park, Chemistry and Chemical Biology, led CCMR’s efforts. The established Sproull Lecture, endowed by former Cornell Vice President, CCMR Director and Physics Professor Robert L. Sproull and his wife, Mary Sproull, took place during the Symposium. Professor Xiaowei Zhuang, Chemistry and Chemical Biology, Physics at Harvard University & Investigator of Howard Hughes Medical Institute, was the 2012 Sproull lecturer. Professor Zhuang has pioneered single-molecule fluorescence studies of biomolecules. She has been developing a super-resolution fluorescence microscopy method, STORM, which breaks the diffraction limit and allows fluorescence imaging with nanometer-scale resolution. She gave numerous examples of her lab applying this high-resolution imaging method to investigate neurobiology and cell biology problems. The Symposium speakers included Dr. Vic Liu, Electrochemical Energy Research Laboratory at General Motors, and Dr. Frances M. Ross, IBM Research Division, T. J. Watson Research Center, and distinguished faculty, and graduate student speakers from Cornell University. The speakers gave overviews of their current research interests and highlighted some potential applications of their work. Research within the CCMR focuses on developing a fundamental understanding of advanced materials to predict and improve their properties. The characterization methods developed within the center for probing structural, physical and chemical properties of materials with spatial resolution ranging from atomic to macroscopic length scales, have impact across a broad range of disciplines, many with commercial applications. This year’s lectures and poster session demonstrated the impact of electron microscopy and aberration correction in the study of crystal growth, of biological materials and of the composition and bonding in nanostructures. 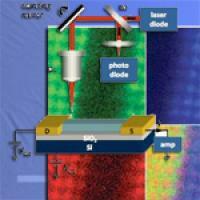 New tools enabling the analysis of mechanical, magnetic and electronic properties at the nanoscale were presented. Students from various departments and two companies presented 44 posters. Lauren Matlock-Colangelo, a student of Professors Margaret Frey and Antje Baeumner, who presented “Nanofiber-integrated microTotal Analysis Systems” with her colleagues Daehwan Cho and Christine L. Pitner, received the award for the best poster. The poster was selected by our industry guests. Many thanks to Kim Cotton, who took care of all the logistics; to Christina Bucko, who was in charge of the audiovisual equipment; to LiLynn Graves, who was the symposium website manager and graphics designer; and to Kaleigh Muller, and John Sinnott, for their help and general support. This team effort was led by Dr. Michèle van de Walle.